The last week of classes before the holidays at the Wilderness Certification Program was exciting and challenging. On Wednesday we put the skills and knowledge we've acquired to the test in three different naturalist challenges. 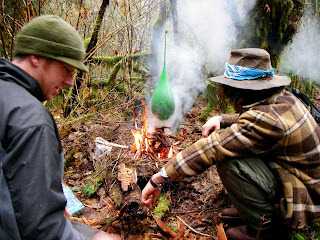 In the first challenge, two teams competed to light a friction fire on a rainy day to pop a balloon in under an hour and a half. Team Chupacabra passed with flying colors but unfortunately the weather got the better of Team Owl, who did however manage to keep their tinder bundle smoldering for over an hour. On Thursday, the real challenge started when we built our own bow drill kits out of entirely natural material harvested that day. Luckily it wasn't raining that day, but finding dry wood was difficult to say the least. Never the less, two different groups still blew a coal into flames; it was a good day. On Friday we went to Northwest Trek to learn more about wildlife native to the Northwest. A striped skunk wakes from his nap to eye the camera. A giant pacific salamander close up. Finally! A huge coal from an all natural bow drill kit. Some sort of slime fungus, looks like grape jelly. Some inner cedar bark shavings drying in the sun for tinder. Happy holidays to all, will post again after the new year! Love these new photos. They are all awesome. I can't decide which one is my favorite. Glad you guys all got to go to NW TREK. That is an awesome place.